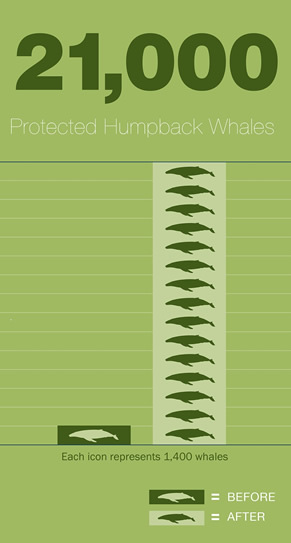 The humpback whale is an endangered species. Humpback whales were plentiful in oceans worldwide before the global population was depleted by commercial whaling at the start of the 20th century. In 1993 it was estimated that there were 6,000 whales in the North Pacific Ocean, and that 4,000 of those came to Hawaiʻi. Through an international ban on commercial whaling and protections under the Endangered Species Act and the Marine Mammal Protection Act, the North Pacific humpback whale population now numbers more than 21,000. The population of humpback whales that uses Hawaiʻi's waters as their principle wintering ground is likely more than 10,000 animals. This number is based on a comprehensive research effort that occurred between 2004 and 2006 that estimated the population at approximately 10,000 animals, and the likelihood that the population is still increasing at some unknown rate. Most of the North Pacific stock of humpback whales winter in three nearshore lower latitude mating and calving areas: Hawai‘i, western Mexico and the islands of southern Japan. 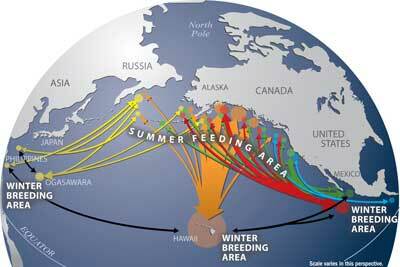 During the spring and summer they migrate as far as 3,000 miles to feeding areas over the continental shelf of the Pacific Rim, from the coast of California north to the Bering Sea (between Alaska and Siberia). Humpbacks continuously travel at approximately three to seven miles per hour with very few stops. The main Hawaiian Islands may contain the largest seasonal population of North Pacific humpbacks in the world. Migration data from SPLASH Research. The North Pacific stock of humpback whales feed during the summer in northern waters (between approximate latitudes of 40-75° N). The cool, nutrient rich waters around Alaska provide ideal feeding locations. Humpback whales have plate-like bristles known as baleen in their mouth instead of teeth. They feed on krill and small schooling fishes, such as capelin and herring. A variety of feeding methods are used including bubble net feeding and lunge feeding. Humpbacks rarely feed in their wintering areas and it is not known if they feed along their migratory routes. Humpback whales feeding in Alaska. 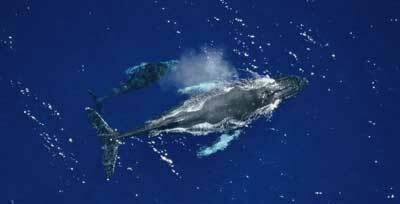 Hawai‘i is the only state in the United States where humpback whales mate, calve, and nurse their young. 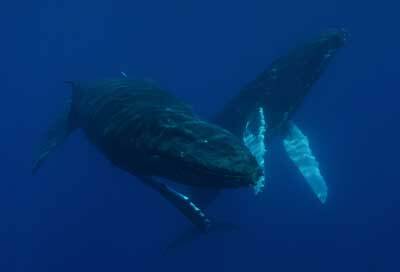 Humpbacks may find Hawai‘i suitable because of the warm waters, the underwater visibility, the variety of ocean depths, and the lack of natural predators. Mothers can be seen breaching alongside their calves and males can be seen competing with one another for females in fierce head-to-head battles. Mother and calf humpback whale, aerial view. Although many species of whales and dolphins are vocal, humpback whales are best known for their songs. 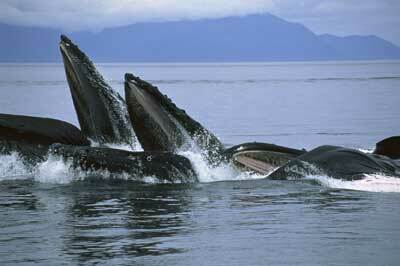 The “humpback song” consists of sequences of sounds that are repeated over and over in a pattern. Patterns of humpback whale sounds change from year to year and can vary in different parts of the ocean. 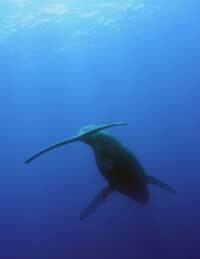 Scientists have found that male humpback whales sing while in their breeding grounds. Other humpback whale sounds have also been recorded in feeding areas. 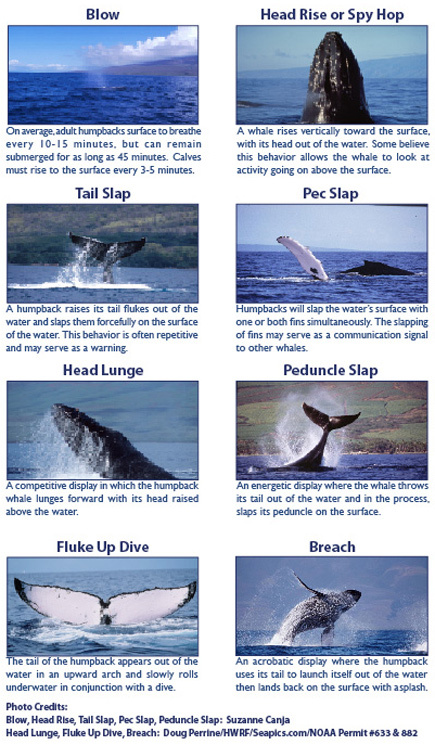 Each of the sounds made by the humpback is thought to have a distinct purpose. Research continues on this fascinating topic. Listen to a humpback whale song recorded in sanctuary waters. Singing humpback whale in sanctuary waters. Humpbacks spend over 90% of their lives under the surface of the water. They are often called "gentle giants" because of the tendency of these large mammals to glide slowly and gracefully while underwater. Current studies focus on understanding the subsurface behaviors of this endangered species. Humpback whales "dance" in the sanctuary. Humpback whales can be seen in Hawai‘i’s nearshore waters during winter and their impressive acrobatic displays are often visible from miles away. "Great wings of New England"